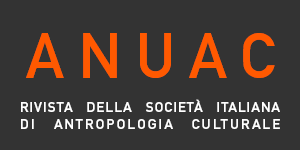 Anuac is the international peer-reviewed, open access journal of the Italian society of cultural anthropology (SIAC). Anuac fosters and promotes the dissemination of anthropological knowledge and publishes original research contributions in all fields of social and cultural anthropology. Anuac is ranked journal of "Classe A" for academic section 11/A5 by ANVUR (the national agency in charge of evaluating university and research institutions in Italy). Anuac is indexed/abstracted in ACNP (Italian Periodicals Catalogue), BASE (Bielefeld Academic Search Engine), DOAJ (Directory of Open Access Journals), JournalTOCs, Google Scholar, Ulrichsweb - Global serial directory, WorldCat OCLC. Anuac accepts contributions in Italian, English, French, Spanish and Portuguese.